Vegetable Pulav is a rice cooked with mixed vegetables & whole spices. It is easy to make and delicious to taste. 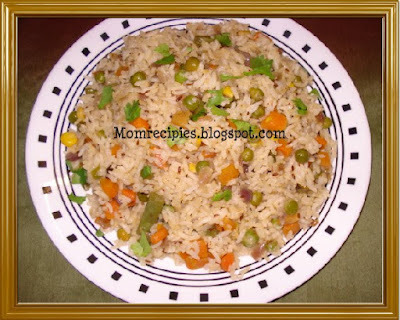 Veg Pulav has loads of vegetables in it so it is very healthy indeed. 1) Soak rice in water for 15 mins. Drain & keep aside. 2) Heat oil in a pressure cooker & add cumin seeds. 3) Once the seeds pop & splutter, add green chillies, ginger garlic paste, bay leaves, cinnamon, Black Pepper,cloves, star anise. 4) Add chopped onions & saute till onions are transparent. 5) Then add Garam Masala and chopped mixed vegetables and cook on medium for 4-5 mins. 6) Add a chopped tomato and stir fry for a minute. Add the drained rice and saute for 2 mins. 7) Add salt as per taste and Cardamom powder. 8) Then add 4 cups of water & mix well. 9) Close the lid & let it pressure cook on medium flame till its done. 10) Once the rice and vegetables are cooked, turn off heat. Add fried cashew nuts and garnish with fresh coriander leaves. 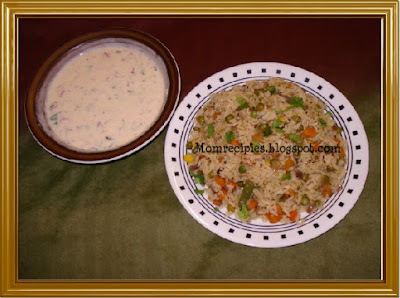 11) Serve warm with raita.